This is what Kyla, a friend of mine, said to me when I asked her how she’d managed to nearly double the annual sales of her team. Let me give you a little backstory. We were having a drink over the holidays a couple weeks ago. The last time I saw Kyla was the year before, for our usual holiday get together. Back then my friend was miserable. She’d recently been promoted to Director of Sales at a division of a mid-sized company. The promotion was something she’d dreamed of for years, but her first couple of months in the position hadn’t gone the way she expected. She was hoping to make a dent in some of the pre-existing problems on the team—flat sales, low morale, and the challenge to attract great salespeople. But those problems were still there. As Kyla explained to me, she had thought she could make some headway with these issues by changing some of the ways the previous Director, Joel, had operated. Joel had been in the position for over fifteen years. He was a decent, well-meaning guy, but he was controlling. Everyone had to keep strict office hours and follow a pre-set process for selling—using precise scripts and hitting very specific metrics for things like calls per day. Joel would often refer to his team as running like a well-oiled machine. He meant it as a compliment, but it revealed that he saw his reps as cogs in the machine he had built—not very empowering to say the least. For most of Joel’s directorship, sales grew—not at a spectacular rate, but modestly enough to keep the business leaders happy. When sales flattened out, Joel decided to retire, opening up the position for my friend. Kyla was excited to get promoted, because she knew the team had potential that Joel had never let flourish. Kyla first thought she could tap into that potential by treating the reps differently, making them feel like they were all peers and teammates—instead of minions working for “The Man.” She started working closely with the reps, helping them on sales, coaching and encouraging them, and celebrating their wins. The mood of the team seemed lighter than under Joel, but nobody was really much more engaged, or more productive. In fact, the team’s overall performance remained flat. That was the picture Kyla painted for me last year. When we got together a couple of weeks ago, I saw a different Kyla. She was beaming, full of positive energy. Her team had almost doubled its sales over the previous year—a result the company didn’t usually see in any of its divisions. When I asked her how she’d managed to turn things around, that’s when Kyla said she’d done it by starting a quiet revolution. When I asked her what she meant, Kyla told me that soon after we met last year, she’d had a revelation—she was never going to bring out the team’s potential just by behaving differently from Joel. And that’s because the main issue that was holding the team back—the element of control—was baked into the systems, processes, and structure of the team, as well as the larger company. The systems and processes for selling were all very prescriptive—they told the reps exactly how to sell. They didn’t allow for creative leeway and new approaches. All the metrics that Kyla had to report on demanded the reps spend their time in specific ways, which did more than just stifle creativity; it forced people to act in ways that weren’t necessarily driving the best results. Reps would do what it took to hit their activity metrics, rather than what they felt would create new and bigger opportunities. The compensation structure was also controlling because it only rewarded narrow ways of working; it didn’t, for example, encourage reps to work together, which is something some of the reps knew would drive new sales growth. General business practices like office hours and performance reviews with their elaborate rating systems—those were controlling by nature. Just changing how Kyla behaved as a leader had little impact on the team, because it didn’t change the fact that the reps had little freedom or choice in how they worked. To eliminate the element of control, Kyla would have to tear down the controlling infrastructure. Kyla made the decision that she was only going to care about results—sales results and some broad metrics that she felt were essential stepping-stones to hitting the quota. She was going to let the reps handle the “how” part of their job. Nobody had to comply with old processes or work with the old systems. If some of them wanted to stick to how things were done in the past, that was fine. But if they wanted to try new ways, they had the freedom to do that. What mattered was results, and Kyla was there to help the reps, or get out of their way and let them fly. Kyla also revamped the comp structure so that it rewarded a variety of ways of working. Kyla knew that getting the endorsement from above for this radical strategy wasn’t going to be easy. The company leaders weren’t prone to giving a long leash to their employees and trusting that they would actually help the business rather than abuse their privileges. So, instead of seeking approval first, Kyla decided to just go ahead and do it, knowing that when results improved, she would be in a position to defend the merits of her strategy. Thus her quiet revolution began. For Kyla, things were chaotic in the beginning. Some reps had trouble adjusting to the new freedom and felt paralyzed. One eventually left. But most of the reps embraced the opportunity to generate ideas and actually have the chance to implement them. Within a few months many of the reps were rolling with completely new methods of selling. Some had jumped into social media, leveraging it in innovative ways to prospect—something that had never been able to flourish under Joel. One rep focused on automation technology to qualify leads and move a sale along. A few reps paired up to collaborate on larger accounts. A couple chose to work remotely, or during different hours. Most of the reps didn’t comply with Joel’s traditional processes, nor hit many of the metrics Joel had tracked, but they were getting results. A few saw staggering improvements, and were largely responsible for the lift in the team’s results. While the team worked away in this new world, Kyla played defense with the VP she reported to, often making excuses for not sending along the usual reports or submitting things like formal performance reviews. As Kyla had hoped, the demands for her to comply dwindled as the team’s results ramped up. An added benefit to Kyla’s approach was that her reps began to spread the word among their friends and peers about how they were thriving, which led to an influx of strong candidates and a few great hires. As of our conversation, Kyla wasn’t sure how long she’d have to operate under the radar, but she and the VP had plans to get together in the new year to review how she’d pulled off such a spectacular year. Kyla’s belief was that the VP would have little choice but to embrace her approach and help bring it to other divisions in the company. I loved my friend’s story because it’s a wonderful example of a story that is happening in small and large degrees all across the world. Leaders everywhere are realizing that in order to unleash the potential of their people they have to make not incremental changes, but radical changes to the ways their businesses operate. These are leaders who understand that many business practices have lost their relevance and value and are only held in place by the heavy weight of tradition, and that it is up to them to find the courage to remove the dead weight. Some of those stories are found at companies like Adobe, which has ditched the traditional performance review for informal check-ins. Or at Valve Software where there are no managers, and where—as Forbes has reported—“each member of staff is able to choose the project he or she is working on.” Many of these stories are about companies moving to something called a ROWE—a results-only work environment, akin to what Kyla achieved with her sales team. Seeing as it is the beginning of a new year, which offers us all the opportunity to make this year dramatically better than the last, I hope you find some inspiration in the story of Kyla and what she was able to accomplish in a single year with her quiet revolution. 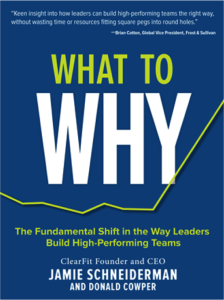 If you haven’t already read What to Why, the free 20-minute eBook changing how leaders build top teams, which I coauthored with ClearFit founder and CEO, Jamie Schneiderman, you can download it here. After a brief stint as a child actor on SCTV Donald went back to school and had to do homework like everyone else. Sometime later, he became an entrepreneur, business coach, best-selling author and content marketing professional. He enjoys playing the piano and thinks food is delicious.